Since I haven't done much fiberish work this week to share for Fiber Arts Friday, I thought I'd share some other folks' fiber art that I've seen on Flickr. 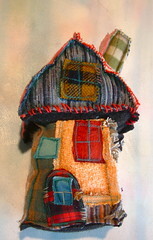 Karna Erickson (eanie meany on Flickr and Cocoon Designs on Etsy) makes these fantastic recycled fabric houses, plus stuffie creatures and other fun things. Chandra LaMorte (aliastriona on Flickr) has a very distinctive color palette. Whether she's posting photos of her knitting or dessert, I can usually recognize which thumbnail image is hers in my list of recent uploads from my Flickr contacts. I think I had originally come across Joyful Lova's photostream because of her Studio inspirations photoset where she had collected clippings & ideas for organizing sewing studio space. 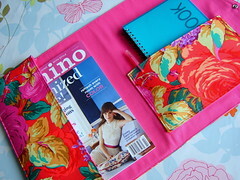 But I was quickly distracted by all her colorful sewing projects (totes, organizers, purses, oh my!) and interesting collections of fabrics (see her photosets). 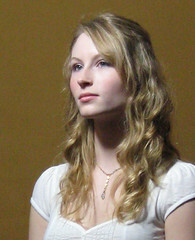 Her blog lists her on-line shops as well. Hmmm... maybe I'd better stop here in case I have to do this again next week with! Share and enjoy! I'd been deluding myself into thinking that maybe, just maybe, Outdoor Cat (above) had been spayed, but on the morning of May 8, our neighbor reported that Outdoor Cat had been performing naughty acts on our front porch with Other Outdoor Cat (right). 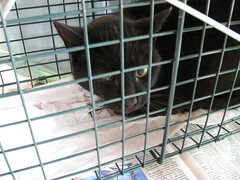 On the advice of Julie (kisluvkis), I attended the Wisconsin Humane Society's orientation for Community Cat Caregivers last Saturday, since their Trap-Neuter-Return program is now available for feral cats outside of Milwaukee County as well. Then this week, since I'm working at home all week, I began the process of Outwitting Outdoor Cat. I bought a wildlife trap on Saturday (my first visit to Tractor Supply Co.) and left it on the front porch draped in a sheet, with the door locked open so she could get used to its presence. My initial plan was to trap her on Sunday night and take her in for spaying Monday morning, but apparently she overhead me saying this and did not show up for dinner on Sunday. She reappeared on Monday morning just late enough that I wouldn't have been able to take her in for surgery (since she had to be dropped off between 8-9 a.m.). I gave her a little bit of breakfast but at Julie's suggestion I withheld food for the rest of the day. In the evening, I put warm sardines in the trap, but she pointedly sat by the front door (next to the open trap) waiting for me to bring her food in her dish. We did our best to ignore her pathetic gaze, and around 10 p.m., my husband reported that the trap door was shut. 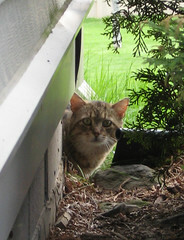 But it turned out to be Other Outdoor Cat, the male who apparently wasn't as cautious where sardines are concerned. (Should have taken a picture of him.) I'm still convinced OOC lives somewhere else because he looks well-fed (could be more wishful thinking on my part) so I let him go and re-set the trap. (His time will come for the snip, I'm sure.) 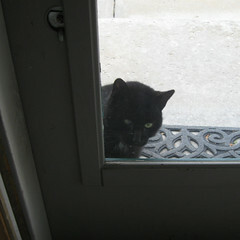 When we went to bed a little before 11 p.m., Outdoor Cat had returned to stare in the front door waiting for dinner. At one point she sniffed at the trap, but didn't go in. I woke up at 1 a.m. and the trap was still open, and O.C. was nowhere to be seen. Indoor cat Nuts woke me up at 3 a.m., and lo and behold! The trap was shut! I half expected to find Other O.C. in there again, but instead there was Outdoor Cat looking very annoyed. I bundled her into the garage and went back to bed. The next morning, I dropped her off at the Humane Society knowing there was a possibility she might not be coming back, if she was deemed adoptable and they could find a good home for her (the outcome I was hoping for), or if she tested positive for a communicable disease like feline leukemia, in which case they would have to euthanize her. So I spent the day waiting for a phone call good or bad, but no phone call meant I could pick her up after 4:30 p.m. So now she's resting in our garage, under observation for 48 hours before I can let her go. 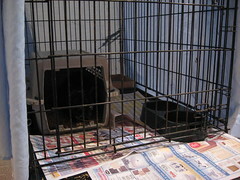 Our neighbor lent us his dog kennel so she didn't have to spend two days in the wildlife trap. I can offer her food tomorrow morning, and in theory I'm supposed to check her stitches, but I don't think that's going to be very easy. The black blob in the white plastic carrier is her, still looking peeved. As part of the program, she had her ear notched, so observers can tell she's been spayed, and she now has a microchip identifying me as her owner should she ever get picked up as a stray, though after this adventure, she may never want to see me again! 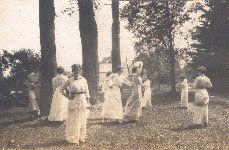 I'd fallen off the MIM bandwagon this last month or so, but this past week's Make It Mondays theme is Vintage Photos! Hmmm.... wonder where I'll find some of those.... So here are two digital ATCs that I've been working on since I took the "Intro to Photoshop for Non-Professionals" class at Mount Mary College. This month's theme for the Milwaukee ATC group's live trade is "May Day! May Day!" so the Queen of the May above started out as a vintage lady from the Ten Two Studios Tinted Twenties Cuties image CD. 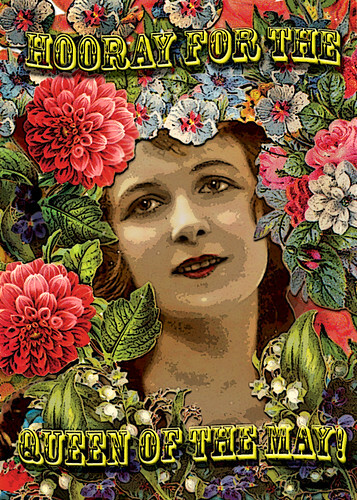 She quickly became smothered in flowers from a Dover "Old-time Floral Vignettes" clip art CD and then run through some of the Photoshop standardized filters just to see what happens. Poor girl doesn't know what hit her (hence the dazed smile)! 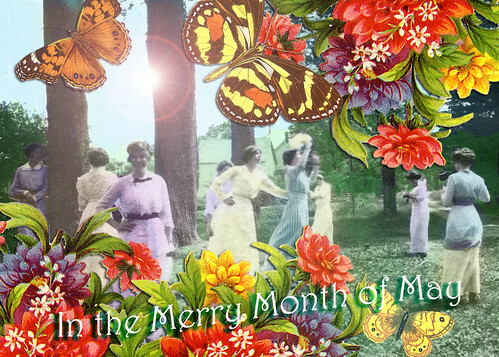 Below is "The Merry Month of May," which uses a scanned black & white image from my personal vintage photo collection. 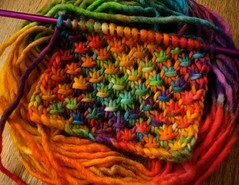 I'm just getting a head start for Fiber Arts Friday, since I'll be off-line most of the day. 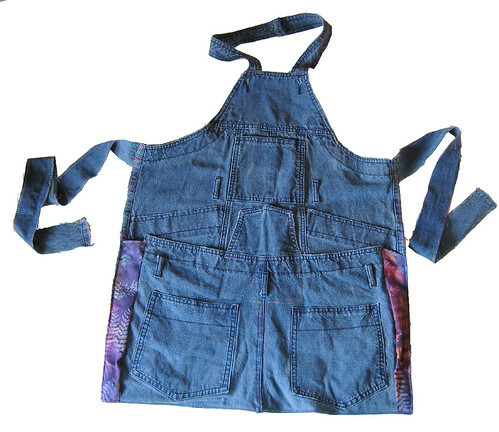 My big artsy accomplishment this week (and this isn't saying much) was finally sewing together this work apron recycled from a pair of overalls. It looks complicated but really, you just cut the front from the back along the side seams, trim off the legs and sew the back face up on top of the front to create a whole lot of pockets! I actually had chopped my old overalls last year, and then they sat forlorn waiting to be sewn together. I did have to add some strips of fabric on the sides to even out the difference in width between the back and front (I didn't cut my seams very evenly). I made the apron ties with strips cut from the legs. The Mother's Day countdown may be over at Ten Two Studios but Lisa's still posting new projects every day made by the design team, and you can still leave comments for us! 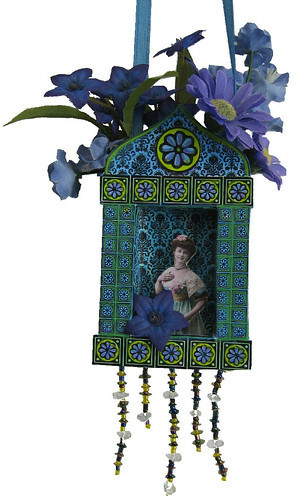 :D Today she posted my take on the Color Me Floral Matchbox Shrine sheet, which I turned into door hangers, inspired by the paper May baskets that you hang on doorknobs. (Remember those school art projects?) I glued an extra matchbox sleeve on the back to hold the faux flowers plus some ribbon on the side to loop over a doorknob and some beaded trim at the bottom because it needed some dangly bling for the cats to play with. It's Fiber Arts Friday! 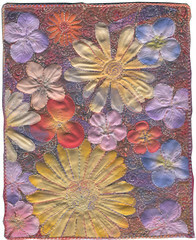 First I want to give a big thank you to my cousin Janet who made a donation to the American Cancer Society this week and acquired my art quilt Spring to Summer through the Fiberart for a Cause Collage Mania 2009 fundraiser, which ended yesterday after raising over $18,000 in three days! I had donated the piece in honor of Janet's mother, my aunt Flo, my mother's sister. Next I have to answer my friend Michele's question posted in the comments on yesterday's Ten Two Studios Mother's Day Countdown (running through May 10!) She asked what I had used to stamp the pattern on my envelopes. It's a carved Indian printing block designed to do a repeat floral border on fabric (visible in the lower left hand corner of this photo). In theory, it's an "antique" (or sold that way - it's at least 20 years old since my mom bought it in India in the 1980s!) so I didn't want to apply any ink or paint directly to the wood. 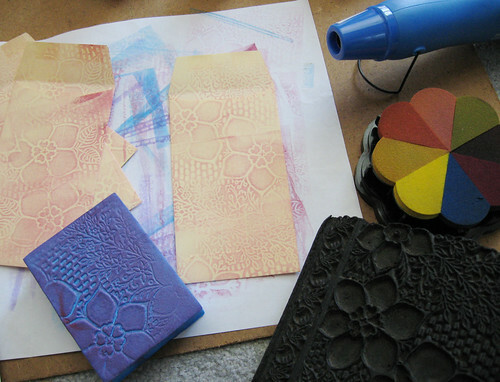 Instead I used a "Magic Stamp" moldable foam stamp (the blue block in the photo), which can be zapped with a heat gun and then pressed against the patterned surface to make a reusable stamp! If you heat it again the texture goes away and you can repeat the process with something else. I've made stamps with delicate items like crocheted doilies, vintage buttons, and antique lace, as well as flowers and leaves from the yard. 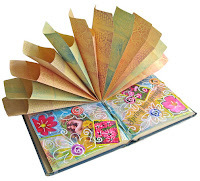 I first read about Magic Stamps in Transforming Fabric: Thirty Creative Ways to Paint, Dye and Pattern Cloth by Carolyn A. Dahl, but I have yet to use them on fabric! A bit late in the day, I know, but I'm on the front page of Ten Two Studios today (May 7) for the Mother's Day countdown. 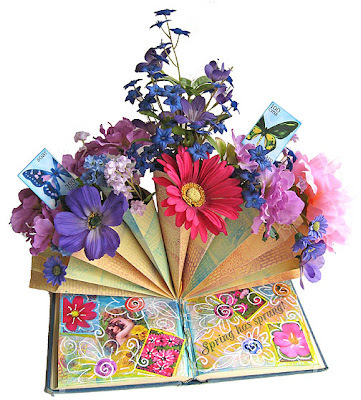 Leave a comment over there about my Envelope Epergne (that's a fancy name for a multi-tubed flower vase) by the end of the day today, and you could win the drawing for a free six-month subscription to the Monthly Muse e-zine. Collage Mania 2009, the Fiberart for a Cause fundraiser for the American Cancer Society, starts today! Since I've had some friends say they had a hard time finding information and art/artists on that website, here's some advice. 1) Be sure to scroll down each page to see the page-specific content. Many of the pages have some general graphics and links at the top that hide the content below. The list of participating artists is here. 3) Read all the directions carefully because the process is somewhat convoluted. Behind the e-mailing and on-line donation, this is a non-automated system carried out by volunteers. You e-mail Virginia Spiegel telling her what you want to buy, and she e-mails you back to confirm that you were the first person to request that piece (or not). Then you make an on-line donation as directed. When the donation has been confirmed, your e-mail address is given to the artist whose piece you purchased so he or she can ship directly to you. This contact may not occur immediately. I was told I would be informed who (if anyone) purchased my piece after the fundraiser had ended (and presumably the dust had settled). I choose the personal touch for both artists and patrons over computer efficiency. Collage Mania is not automated in any way and all transactions are handled by me personally. While this may not be the height of efficiency, it does ensure that 100% of the proceeds are donated to the American Cancer Society. And all that artwork will remain on-line for future reference! Yesterday I had my first *Camp experience attending PhotoCamp Milwaukee at Bucketworks in downtown Milwaukee. 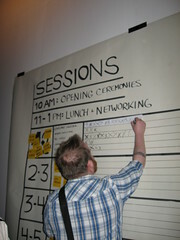 This was an Unconference with no pre-set sessions. In the opening ceremonies at 10 a.m. (I wasn't one of the crazy people who turned up for the 5 a.m. photowalk ;o), everyone introduced themselves and said what they wanted to learn and what information they could share. Based on these comments, participants proposed sessions they might lead, and these were written down on sticky notes. Then impromptu scheduling began on a huge piece of paper stuck on the wall. People put an X by the session they thought they might attend, and meeting spaces were assigned accordingly, but everything could change on the fly. 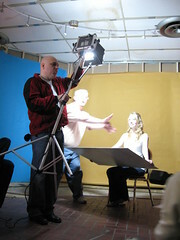 My favorite session was Simon McConico showing how to do portrait photography with natural lighting (another one I had not originally planned to attend). He posed his models against nearby walls and in the alley across the street with fabulous results. Here we are waiting for the sun to appear from behind the clouds and backlight the model Ely. You can see more pix from PhotoCamp in my Flickr set or the Flickr group pool. So I'll direct you to Ten Two Studios because Lisa Vollrath's doing a countdown to Mother's Day May 1-10, 2009. She's posting a new piece of art by design team members each day, and if you comment on it, you're entered in a daily drawing for a free six-month subscription to her creative e-zine The Monthly Muse.